A hidden gem in the woods. 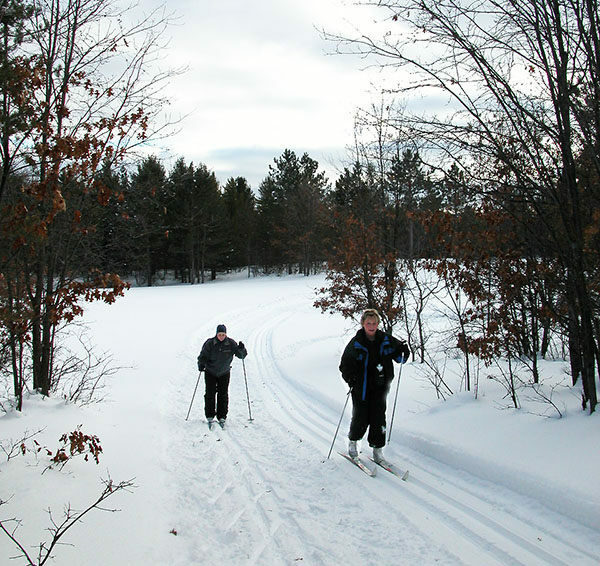 Loud Creek Cross-Country Ski Trail dates back to 1984 when a group of locals approached the Huron National Forest rangers in Mio about building a trail system for their skinny skis. 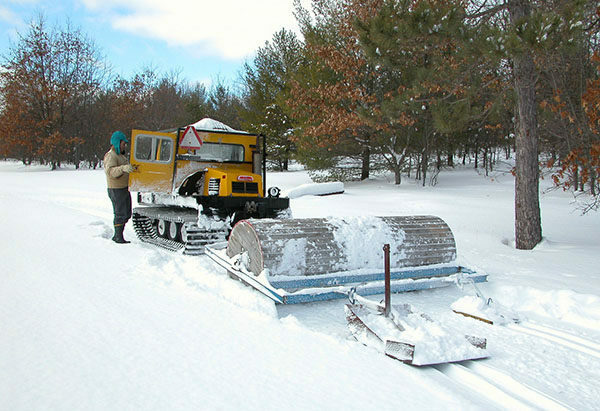 They formed the Loud Creek Nordic Ski Club, found the ideal tract of flats and hills 2 miles southeast of Mio, laid out a variety loops and then raised the $7,500 needed to purchase a used Bombardier groomer. The Nordic club never had more than 30 members and most of the time it was a faithful dozen or fewer who cleared the brush in the fall, built trail signs and impeccably groomed the 7.5-mile network of trails in the winter, all to the delight of those of us who stumbled across it. 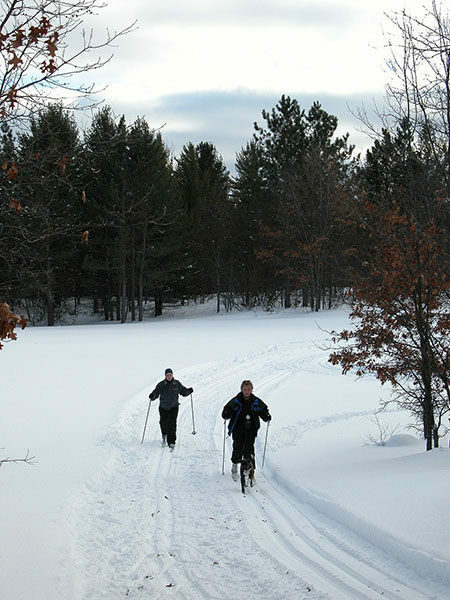 Tucked away from busy interstates and state highways – the trailhead is on a dirt road – and rarely promoted by the ski club or the U.S. Forest Service, Loud Creek is often called “the best kept secret in Northern Michigan.” Ten skiers would be a busy afternoon on the trails. 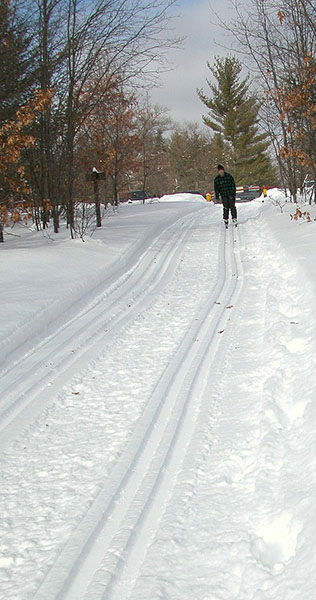 Today the trail system is maintained and groomed by the Mio Ranger District which attempts to lay fresh tracks, but not skating lanes, before the weekend or after especially heavy snowfall. Loud Creek is spread across 960 acres and laid out in seven interconnecting loops that traverses a mix of northern hardwoods and some large pines. What makes the area so ideal for skiing is that it's relatively flat near Cauchy Road and the further south you ski the steeper the hills. From the trailhead on the north end to the steepest hills on south end, there’s 230 feet difference in elevation. Some short stretches of the trail go from 5 percent grade to more than 25 percent. None of the loops at Loud Creek are long. At 1.5 miles Valley View is the longest. But the trail system is designed so it's easy to re-ski a loop that you enjoy two or even three times before moving on to the next one. The trails are well with maps at the junctions and diamond shaped confidence markers. Loud Creek was designed for winter use by Nordic skiers and snowshoers along with a sled hill that is a short walk from the parking lot. The rest of the year the area is open to hikers and trail runners but not mountain bikers. In the winter the seven loops at Loud Creek are skied in various directions with some segments designated for two-way travel. The mileage after the name of the loop below is the distance from the trailhead that includes segments of other loops required to reach it. Skiing all the loops would require skiing three sections twice and would make for a 6.8-mile outing. Lazy 8 (1.4 miles): The only loop rated easy is skied in a counter-clockwise direction but does also feature a two-way section from the trailhead for those who want to head straight to the more challenging runs. That section winds through a meadow in the beginning and then passes a side trail to the sled hill before gently descending to post No. 2. At post No. 3 you can continue onto Creek Circle or head back to the trailhead, a ski of 0.74 miles. Creek Circle (2.1 miles) Traveled in a clockwise direction, Circle Creek is rated moderate and begins at post No. 3 with a quick drop to a bridge over a small creek in a stand of cedar. Look for deer here. On the other side you climb to post No. 7, passing some impressive white pines along the way. If you choose to return to the trailhead you continue onto what is referred to as The Meadow, where post No. 6 is located and serves as the hub of the wheel for the Loud Creek trail system. Just beyond post No. 5 is a fun downhill run and after that the Creek Circle dips and climbs until returning to Lazy 8 at post No. 4. Marks Run (2.8 miles) Also moderate in difficulty and skied in a clockwise direction, Marks Run is picked up at post No. 7 and within a quarter mile reaches a substantial. A bypass allows you to skip the hard climb and steep downhill that follows. You quickly reach post No. 16, the junction to Leaky Hills Loop, and climb and descend the same ridge again to post No. 17. The last leg to post No. 6 in The Meadow is a level ski. Leaky Hills (3.6 miles) The loop is a mix of moderate and challenging segments with the steepest downhill encountered just past post No. 16. You descend almost 100 feet, bottoming out at a bridge across Loud Creek. On both sides are beaver ponds. At times a dam is so close to the bridge you can almost touch it with your ski pole. At post No. 15, the loop continues to the right where more rolling terrain is encountered before reaching post No. 12, the junction with Long Grades. Long Grades (3.3 miles) Long Grades is a pair of loops of moderate difficult with the Short Loop a 2.9-mile ski from the trailhead and the Long Loop that follows a 3.3-mile run. Both are skied in a counter clockwise direction. You pick up the Short Loop from Creek Circle at post No. 5 and begin a long, easy climb and an equally long and enjoyable descent – thus the loop’s name. You bottom out at post No. 8 where you head right to include the 0.4-mile Long Loop that begins with another long, gentle descent to post No. 11. By heading left at post No. 8 you skip the Long Loop and head back to The Meadow and Creek Circle. Valley View (4.9 miles) The longest and most scenic loop by far is Valley View. You pick up the challenging loop at post No. 15 and ski it in a counter clockwise direction with the first segment also part of the Leaky Hills Loop. At post No. 11 you begin a quarter-mile climb of almost 100 feet and then swing south to come within 30 yards of Forest Road 4240, a snowmobile trail in the winter. From there you descend quickly into a ravine, re-climb it and then ski along the edge of it, gazing at a creek below. Your "valley view." Suddenly the trail swings sharply south again and you're flying down a steep slope into the ravine once more, this time bottoming out at a bridge across the creek. On the other side you climb steeply to post No. 13, the junction to a two-way segment back to post No. 15. Porky Park (4.2 miles) The most challenging and last loop to be built was Porky Park. Most skiers pick it up at post No. 15 where a short two-way segment leads to post No. 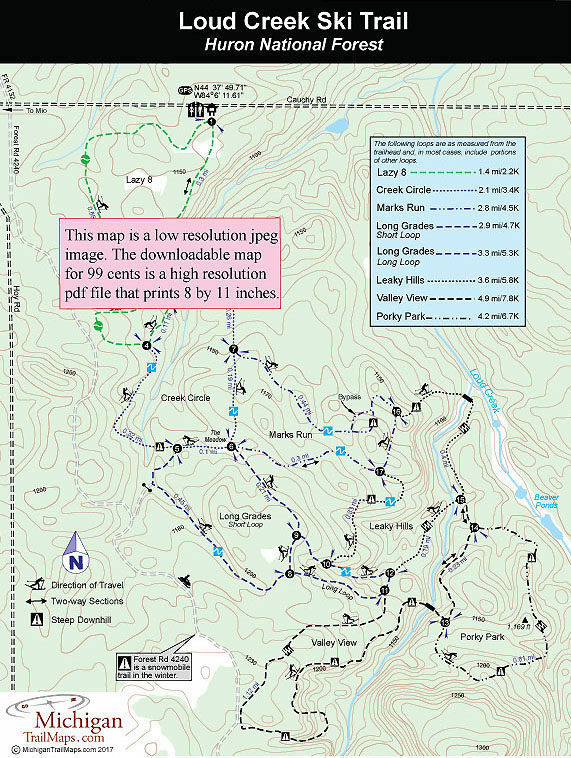 14 and the 0.84-mile loop that is skied in a counter clockwise direction. You begin with another two-way segment to post No. 13 and then in the next half mile enjoy three long climbs with steep descents on the backside before returning to post. No. 14. There are no amenities at the trail other than parking. 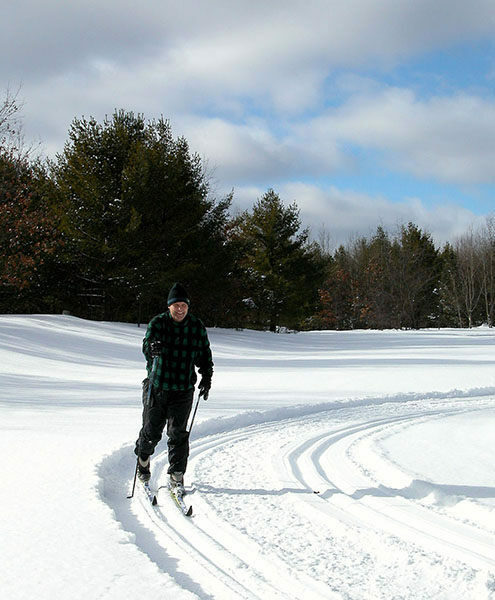 Loud Creek Ski Trail is open year round and there are no fees for parking or using the trail system. The best part of about Loud Creek is the amount of time it takes to get there. From Flint the ski trail is less than a two-hour drive. If you live in Bay City it's only 90-minutes away. To reach the ski area from M-33, head east on 14th Street a half mile south of Mio and follow it 1.6 miles to Cauchy Road. The trailhead is another half mile east on Cauchy Road. For more information contact the Mio Ranger District at (989) 826-3252.